* Business Ringtones –> Grátis. * Shelf Themes Free –> Grátis. * Color ID –> Grátis. * Theme Free –> Grátis. * Wallpapers Sky –> Grátis. * HD Themes –> Grátis. * Color Caller LED Free –> Grátis. * 3D animal Themes –> Grátis. * Perfect Theme Free –> Grátis. * HomeScreen Widget –> Grátis. * Ultimate Funny Ringtones –> Grátis. * Ringtone App –> Grátis. * Space Themes Free –> Grátis. * Ringtones Cafe –> Grátis. * Call Assistant –> Grátis. * Easy Smiley Pack –> Grátis. * Amazing Avatars –> Grátis. * Animated Avatars for BBM –> Grátis. 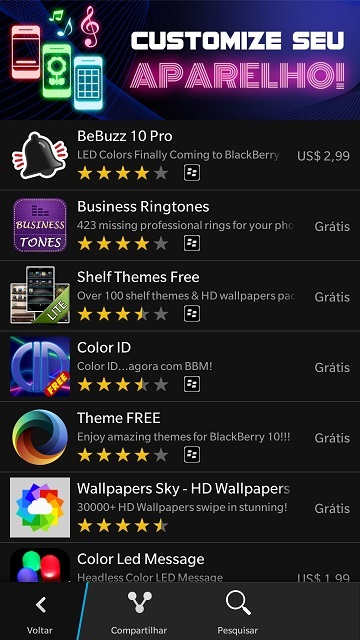 * Facemix for BlackBerry 10 –> Grátis. * Fancy Caracters –> Grátis. * Stickers for BBM –> Grátis. * Wallpaper Cafe –> Grátis. * LED – Coloful lights –> Grátis. * Cutest Stickers for BBM –> Grátis. * Free Sound for BBM –> Grátis. * World Clock – 10 –> Grátis. * Amazing Themes Free –> Grátis. Uufaaaa… lista extensa, agora você pode customizar a vontade seu BlackBerry e deixa-lo único, divirtam-se :D.
Anterior Post anterior: John Chen (CEO BlackBerry), da entrevista à The Hindu’s Business Line. Avançar Próximo post: Mais um vídeo do BlackBerry Passport suge na internet :D.